This was taken on Nigg Pier about 1955. Good pics Billie. Is that your grandfather on the left? Where was Geddes shoe repair located on King St, next to Scotty Campbell or further down? Hi Harry. 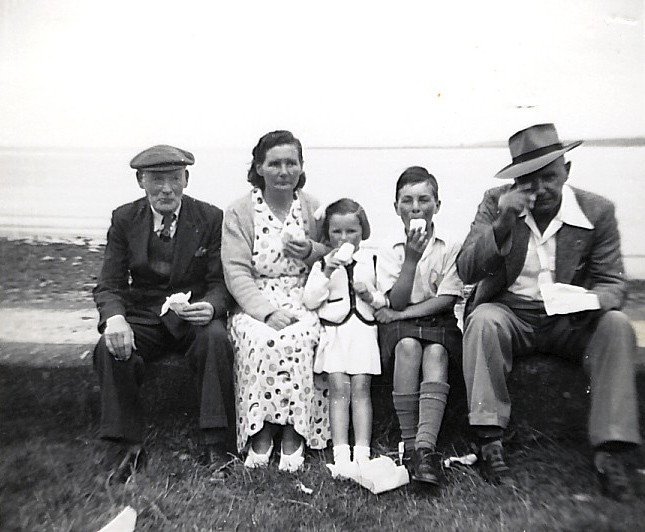 This pic (from the left) has my Grandad Willie Geddes, my Ma ,my sister Jeanette, myself and my mother's brother Ian (on holiday from Australia). The latter had worked very hard and had become a successful sheep farmer. My Grandfather was a bit less successfull and yes his shoemaker shop was at the harbour end of King Street, next to Bodells I think. Photo was taken at Nigg, I was there last year...a bit sad now. Thanks Billy, I remember your grandfather, also remember his shop closing down, but the location escapes me.